How did your team change your life. I was speaking with a few people from other teams, and heard incredible stories of how their team either “got them clean” or “helped them deal with there mental issues” and I was interested, how much more does first mean than we even realize. so I ask what is the most extraordinary thing your team (including mentors) has done for you. I am very interested in your stories so go ahead, maybe it will inspire someone else. isn’t that what first is about? in 8th grade year, I was extremely obese and bullied basically every day. I was borderline suicidal and prayed that the next day would never start. then when I got to high school, I joined my team. it gave me a reason to wake up every day, and it gave me something to be excited about. I managed to lose over 100lbs, and gain a new fondness for life itself. with my newfound confidence given to me from robotics, I stopped letting the bullying hurt me. though I don’t always get along with everyone on my team, we always get along at the end of the day. My team became a second family to me. I felt as though for the first time in my life I actually belong somewhere. I learned a few valuable life lessons along the way that I will remember forever. I learned to trust, I learned that my team always has my best interest in heart and if someone tells me to do something it is for good reason. I learned respect, I was very disrespectful of people because I was scared that if I respected them too much they would use me, and soon I learned what that word really means, i means that you don’t question the rules you just follow them with full belief that your superior knows what they are doing, and finally I learned to love, and passion. I learned that if you truly believe in something and are passionate about it, then you can accomplish anything. Now for Love, that’s a big word to throw around but I really mean it. there are almost no people with whom I would want to spend weeks together in tiny hotels, and spend nights at school till the mid hours of the night with, except for my team. I learned that when it comes to my team, I never regret spending any time with them. I learned that our team is like a family we all love each other in the truest meaning of the word, not in a romantic way but in a fraternal way. I believe that my fellow teammates are almost like siblings to me and I would go to the end of the earth and back for them. well, that’s my story, what is yours? It was 10th grade. I recently just started losing weight to prevent health problems, and I wasn’t content with the new sport I had joined. For years prior I was bullied and I didn’t have many friends, and I was very shy. It was one day when my friend sent me a video of his team’s robot picking up a gear for 2017 Steamworks, and I was intrigued. He told me of a comp he was participating and I watched the full weekend. Within a few weeks, I was at my local community team. Name? Team 3182, Athena’s Warriors. Since my joining, I’ve found a new passion in something I never thought I liked, especially since in Middle School I hated STEM. I was welcomed into something I never felt since my family split six years prior, a sense of safety and community. I made my best friends in 3182. Now almost a year later I’ve been trying to spread my team’s message around, showing what good this team does. This team has been nothing but a blessing to me, despite the number of times I’ve cried to stress and Chairman’s. I also became the captain of the buisness sector, the field I joined on the team. I now have work to benefit something greater than myself, and i’ll be heading to my middle school within a few weeks to present on how FIRST changed my life and what FIRST is. Thank you FIRST and Team 3182. If I didn’t join the X-Cats then I wouldn’t have deepened my involvement with FIRST and taken to volunteering which is my thing. So there’s that. This. I joined my team during my freshman year because some of my friends joined and I really didn’t understand what it was until I walked into a competition for the first time. If I hadn’t joined my team, I would probably have no idea that FIRST even exists. I started volunteering during my sophomore year. I remember watching the volunteers during my first year and admiring the fact that they were taking time out of their lives to support FIRST with no compensation besides recognition, networking opportunities, etc. I would have never found NJFTC which I volunteer for as a Lead Queuer whenever I can make it possible. As a result of my volunteering, my mother has started volunteering for NJFTC as a Scorekeeper, and my grandmother now plans to be a Judge for FTC in Excelsior, NY. I feel as though it was volunteering that really taught me how to feel completely comfortable speaking to people and I’ve made so many friends from all over the world. I did FRC my senior year of high school, and loved it in all the usual ways. I won’t go into great detail since that part of my story is pretty similar to other people’s - my mentors saw potential in me that I didn’t see myself, encouraged me to take on new challenges, and I fell in love with engineering. My team was like a family to me. During college I started developing severe panic attacks, depression and anxiety. The combination of heavy courseload, academic struggle, and sleep deprivation, identity crisis over not being “the smart kid” anymore, and genetic predisposition were a perfect storm of a mental health crisis, and after a couple years of painful struggle it came to a head and I took a leave of absence. While I was home for that semester, I started mentoring my old team. My mentors had had such a huge impact on me, and I had always intended to eventually become a mentor to pay that forward. But at that particular moment of my life, I mainly missed the feeling of being part of a team that felt like a family. I wanted to reconnect with my own mentors again, to spend time with people who believed in me and were always proud of me. Being a mentor was everything I had hoped for and more. I had tremendous fun and made strong connections with my students, showing them the joy of creative problem-solving, training them in reflection skills to guide continuous improvement, and generally having a blast together. But I also got to experience the amazing feeling of adults I looked up to treating me like an equal. They encouraged me to take ownership of projects I thought we should do, and to speak up confidently when I disagreed with them. I loved having a seat at the table for important discussions about how students were doing and the direction of the team. I can vividly remember the day, at the end of the season, after Champs, when one of my mentors shook my hand and told me to call him by his first name. I decided during that semester that generosity, patience, and dedication to service were more important qualities to put at the core of my identity than how smart I was, and that was one piece of how I healed. This year is my fifth season of mentoring, and my second with my new team (I live in a different part of the state now). Mentoring continues to be a core pillar of my life, and I still find it incredibly rewarding and fun. My mental health is more stable these days, but I still have bad days and weeks once in a while, and it means so much to me to still have a team that cares about me. I’m an older alum (my rookie year was the 2000 season for FRC) - before getting involved in FIRST, I’d been purely into science, not engineering. I was a junior in high school at the time, I ended up changing from looking at biochemistry and genetics programs to biomedical engineering programs. I ended up majoring in college in biomedical engineering and electrical engineering. I now also have a masters in neuroscience, and I’m slowly working part-time towards a computer engineering PhD. I work as a research administrator doing all the paperwork side of applying for research grants for several departments at a private university. But I’m still involved in FIRST. I’ve volunteered at FRC events and FLL events. I was a robot design judge at an FLL qualifier today. I coach my older daughter’s FLL Jr team and help coordinate the 14 other FLL Jr through the parent-run group for FLL and FLL Jr in my area. I’ve met some amazing people and continue to through just volunteering with FIRST. I haven’t always been able to every year (I took several years off when I had my older daughter), but I always get drawn back in when given the opportunity. My husband tells me I’m in my happy place after I spend a day doing FIRST stuff. Last year I was at a school that wasn’t a good fit and was in a bad place, being bullied, ostracized, and even getting death threats. I was on their FRC team but nobody cared about it and the robot barely drove. I’d helped found an all-girls FTC team in eighth grade and knew how great robotics could be, but that spark was missing from this FRC team. I applied to a better school who had an all-girls FRC team I’d idolized when I was in FTC. The hope of going there, having friends again, and being on that team kept me going. Thankfully I got in, joined the team, made amazing friends, and haven’t looked back. I transferred into my current school for freshman year of high school from an international school in Africa and was very passionate about music after playing the saxophone for 5 1/2 years. The move inspired me to try something different and try and become a new person, so stopped playing music and started signing up for sports teams in an attempt to meet new people. I played ultimate frisbee, soccer, badminton, basketball, baseball, and so on. It didn’t work. I found myself secluded in the corner of the room during team meetings, silently running laps behind my team and on my own, and feeling left out during lunch and sitting outside in the sun on my own. I didn’t necessarily have a problem with being alone, but the feeling of being a part of a team but also not a part of it was eating me up inside. I dropped all but badminton. I turned to theater but hit the same wall. The problem of going to such a small school was that everyone knew each other already and had their set cliques or groups of friends that I just wasn’t a part of. I had a student mentor, who I did talk to occasionally and I did join her during lunch - but I still felt slightly out of place. I contemplated joining the music program but it was well into the year and I could not exactly switch class schedules so I stuck to it. I had heard about the robotics team halfway through the school year and, since the season was well underway, I had to wait until next year to sign up. I made a note on my calendar and, once next year’s registration for classes opened up, I made robotics my very first choice as an elective class. That summer, I began familiarizing myself with FIRST. I didn’t exactly follow what was going on and gave up after the first month because I got bored with watching videos. Once sophomore year rolled around, and I sat down in the classroom to listen to my mentor and team captains talk about FIRST with such passion, I began understanding the obsession. I was particularly inspired by one student on the team, a team captain (programming lead, and drive coach, too) that was just really really good at robotics. I went home after the first day and wrote, in big letters, in a journal: “I want to be as talented as him.” That very same year, my school’s veteran team qualified for the World Championships and I congratulated them. Because my school had two separate teams (the veteran team and the rookie team) who built two separate robots, I felt as if I wasn’t a part of the success. My mentor changed that quickly and assured all the rookies that they are now veterans after completing a season and have the qualifications of joining the veteran team in their trip to the Houston. I was the only rookie who went and I am grateful that I did. From then on, I knew that I had found my calling. Now, it’s senior year, I am team captain of the robotics team, drive coach, and programming lead. The only way I got to this point was because of my team. I met the most talented, hilarious, genuine, kind-hearted people that I clicked with on the first day. I met my best friend, who I excitedly turned around to at the end of the first day and extended my hand to greet her. I met my mentor, who supports me unconditionally in robotics, in school, in life. The support and the people I met on my team leaked into my everyday life. I began giving more than I already have in school. I began making an effort to talk to people. I began getting involved with the school and neighborhood community. I am happy, very happy, and there’s nothing I want to do more than to spread the love, happiness, and support to everyone around me because that’s what my teammates and mentors did to me, and I needed it. The passion and devotion I have for robotics are far deeper than what I had had for music. My robotics team got me out of my shell. 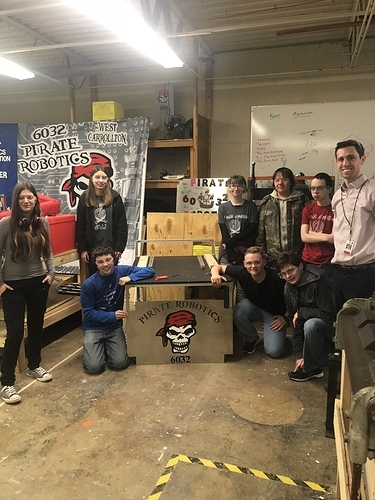 They pushed me to break out of my comfort zone in and out of robotics. It’s funny to say that, if I hadn’t joined robotics, I probably would have never spoken to anyone on that team. Finally, I am writing a singular goal that I hope to complete in the following years as I move into the college that I love. This goal is to give back. Give back to my teammates for sticking with me and helping me through the toughest of times. They celebrated with me during the highest moments and studied with me for AP exams. Give back to my team, the first change that was made this year of was the unification of the veteran and rookie team. Now we are one giant team under one team number instead of two. I worked hard in mentoring the rookies and they have reached a high level of skill that I am incredibly impressed with. Give back to my mentor. He has always been positive, giving me life advice and telling me fun facts. He’s someone that I can talk to whenever I need to and can turn to when I am at a loss. Now, as my team gears up for Houston to conclude my final year, all I can do now is look back with a fond smile and say “yeah, I tried that,” and know that when I leave, this team will be in good shape. There is no other group of people that I would rather go to Houston with, or spend my last year of high school with. Thank you so much for everything that you have taught me and have done for me. No amount of words can describe my gratitude for this team. It’s made me more outgoing and helped me make connections with companies and people alike. First has given me so many new friends and let me go to amazing places and enjoy it with people who speak the same language and share the same passion as I do for the game. When I was a freshman in high school, my mom took me to the 2006 Southern California Regional. We watched 968, 1138, and 4 take out the juggernaut 1st seed 599/330/995 alliance. Later that year, my mom asked if I wanted to start a robotics program at my school. I said something along the lines of “okay mom” (I was 15, put a lot of snark into “mom” into your mental reading of that sentence.) At the time, I was an awkward kid with a few close friends. At the beginning of sophomore year, I was told that I needed to find 14 other people to form a team at our school. Through some luck and work, I found 17 other people and and Team 2102: Team Paradox Robotics came to be. Over the next 3 years we competed poorly, and had a wonderful time. Today 13 years after we started the team, some of those original members are my closest friends. Academically, I got into a school that was out of my league GPA wise (because of my robotics leadership role) and got degrees in Mechanical Engineering and Studio Art. I spent the first two years ahead of the curve because I had experience and context to the things I was learning. Today I’m an engineer for a company called Fluidra. We sponsor 2102, and I’m back as a mentor as of 2016. I wouldn’t have it any other way. My team doesnt know this all that well, but I grew up emotionally abused in a home always stressing with money and with a chronic illness. It sucked, to say the least. The only way I could really survive it was not be fully engaged in life, if you dont think, if you dont react, if you dont cry, those comments wont hurt. I was convinced there was no way im living past 15. But when I was with my robotics team, it was … better. I love robots, they are fun to compete and build and bond with people over but I really came to robotics because of a few key mentors. They were just being kind, asking me how my day was, making me sit down if I hurt something, grabbing a tool or talking through a design with me but I cried almost after every meeting and always left with a smile. Those little acts of kindness and genuinly caring about me kept from so much, I’m crying a little just writing this. They had thought of me and thought of me kindly. I’d catch myself in a rut, staring at wrists, and id just keep telling myself that “I have a robotics meeting tonight, I cant miss that. Just one more day.” I still dont tell them how much they have helped me but I love them so much. I learned to be more open, more confident, just be able to be there and not give up on how desperate my life seemed. That was it. They were kind to me, showed me how to be an actual engineer. When there wasnt money, they would help. When I was sick, they said they will be there when I get better. When I was zoned out of life, they pulled me out of it. Those few mentors helped me so godamn much and they dont even know it. I love them to death and it’s impossible to say just everything wonderful about them. They dont have a mean thought in their head. They cared about me, more than anyone ever did. I’m glad you’re here with us. FRC is a big weird family and I’m glad that people can find a home in it. Well I’d have to say in the beginning for robotics before I decided to go I actually thought it was simply a class where you learn about engineering, basically an extra class and extra homework. This was definitely not the case, in the first year for me it was a little rough, there were plenty of people I did not want to be around which thankfully left before my next year and weren’t interested before competitions. I wasn’t all that great with my hands when building but I knew what I was doing for the most part. This turned really quickly, originally we never had a robotics shop, we had a, “here’s a corner have fun” shop, no space whatsoever and things had to be shoved in a closet everyday. So my first year the maintenance team and muse machine which, the shop wasn’t actually there it is, we had to clean it out and build it. The shop you see below is the first picture I have of it. It was covered from the ground to my head in muse machine equipment granted they cleared some out but still. There was no table, there was no power, there was no tools it was simple floor, shelf and tiny cabinet on the wall. Our biggest problem was muse machine equipment, it wasn’t like “oh it’s just a little bit” no it was pretty much props that were thrown into a giant pile that still haven’t been touched to this day. The maintenance guy’s things weren’t all that bad just a couple cans of oil and old bench top metal benders. 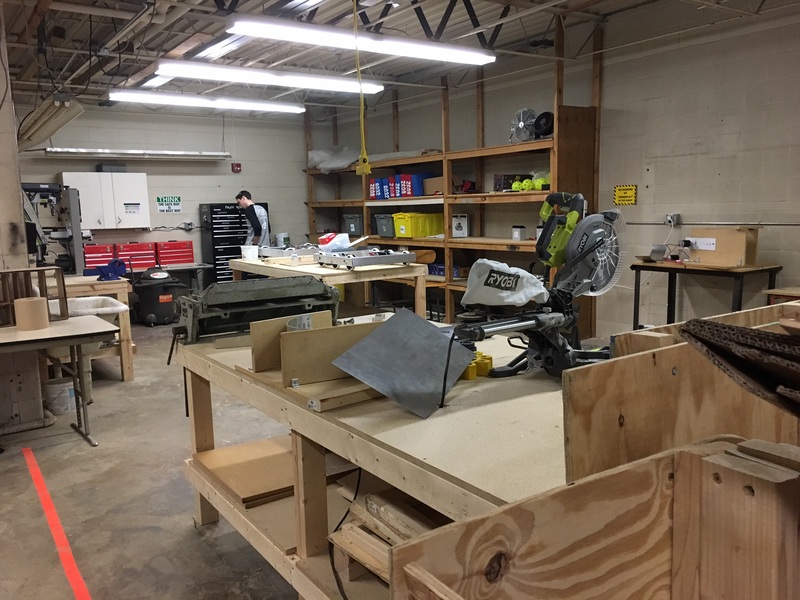 So we started from ground zero, added in two tables and then two more, a coat rack, toolbox, shelf and whiteboard which soon evolved in today’s picture. Doing all of it taught me a lot more skill than I would have learned in one woodshop semester. The hard work payed off and we now have many other things as well, it needs a cleanin but she’s a great shop. Now in my second year especially I had developed a lot of cursing and stress because at the time I lost 3 of four of my grandparents one of which being very important to me so I pretty much felt like I’d lost a big part of me. So here I went into cursing, yelling and being short fused. I wasn’t the greatest person at the time and I’m still not the greatest now but I do my best to contain myself because it’s become more of a habit than from the event of my grandfathers death. Now I have learned to calm myself down and keep from being short fused and yelling I still slip up time to time and yell at someone but we’ve learned to forgive each other for mishaps. Yes I do still curse, no I’m not proud of it and I wouldn’t say I’ve made any effort to stop but I have stopped becoming a drunken sailor lol. It doesn’t show gracious professionalism at all. Although I’m still working my way through, everyone has their mishaps. But to go straight to the point, through the forgiveness of my team and understanding of them I’m grateful for them even if I get frustrated time to time. With this team I’ve learned to not only control myself but improve my building skills. Without FRC I would be a lonely, bitter person who ain’t got nobody but himself in school.